Updated weekly, these grants are provided by organizations offering funds in areas relevant to NCHV’s mission. Check back each week to find funding opportunities for your organization. The U.S. Department of Veterans Affairs (VA)'s GPD program is offered annually, as funding permits, by VA Health Care for Homeless Veterans (HCHV) program to fund community agencies providing services to homeless veterans. The purpose is to promote the development and provision of supportive housing and/or services with the goal of helping homeless veterans achieve residential stability, increase their skill levels and/or income, and obtain greater self-determination. Only programs with supportive housing (up to 24 months) or service centers (offering services such as case management, education, crisis intervention, counseling, services targeted to specialized populations including homeless women veterans, etc.) are eligible for these funds. The program has two levels of funding: the Grant component and the Per Diem component. Grants: Limit is 65 percent of the costs of construction, renovation or acquisition of a building for use as service centers or transitional housing for homeless veterans. Renovation of VA properties is allowed; acquiring VA properties is not. Recipients must obtain the matching 35 percent share from other sources. Grants may not be used for operational costs, including salaries. Operational costs, including salaries, may be funded by the Per Diem component. For supportive housing, the maximum amount payable under the per diem is $45.79 per day per veteran housed. Veterans in supportive housing may be asked to pay rent if it does not exceed 30 percent of the veteran's monthly-adjusted income. In addition, "reasonable" fees may be charged for services not paid with Per Diem funds. The maximum hourly per diem rate for a service center not connected with supportive housing is 1/8 of the daily cost of care, not to exceed the current VA State Home rate for domiciliary care. Payment for a veteran in a service center will not exceed 8 hours in any day. The HCHV programs are administered nationally by Lisa Pape, Acting Associate Chief Consultant, Homeless and Residential Rehabilitation Treatment Programs, VA Headquarters in Washington, D.C.
For more information on the Grant and Per Diem program, click here. The U.S. Department of Housing and Urban Development and VA Supportive Housing (HUD-VASH) program, through a cooperative partnership, provides long-term case management, supportive services and permanent housing support for homeless veterans. Eligible veterans receive VA-provided case management and supportive services to support stability and recovery from physical and mental health, substance use, and functional concerns contributing to or resulting from homelessness. HUD provides "Housing Choice" Section 8 vouchers designated for HUD-VASH to participating Public Housing Authorities (PHAs) to assist with rent payment. The program's goals include promoting maximal veteran recovery and independence to sustain permanent housing in the community for the veteran and the veteran's family. This program began seeing its highest housing placement in 2010. By the beginning of 2011, VA expects nearly 30,000 vouchers to be in veterans' hands. 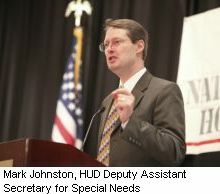 Another 10,000 housing vouchers are expected to be included in the fiscal year (FY) 2011 budget. HUD-VASH was designed to address the needs of the most vulnerable homeless veterans. To be eligible for the program, veterans must: be VA health care-eligible, homeless, and need and participate in case management services in order to obtain and sustain permanent independent community housing. 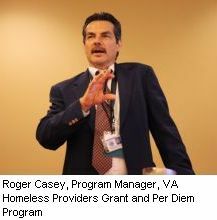 HVRP grants are intended to address two objectives: (1) to provide services to assist in reintegrating homeless veterans into meaningful employment within the labor force, and (2) to stimulate the development of effective service delivery systems that will address the complex problems facing homeless veterans. Successful applicants design programs that assist eligible veterans by providing job placement services, job training, counseling, supportive services, and other assistance to expedite the reintegration of homeless veterans into the labor force. In FY 2010, DOL-VETS funded the HVRP at $36 million. Recent program focuses include incarcerated veterans and homeless female veterans. The Incarcerated Veterans Transition Program (IVTP), which is funded through the HVRP, is designed to support incarcerated veterans "at risk" of homelessness by providing direct services through a case management and counseling approach. Projects that provide services to veterans at one or more levels of the correctional system – i.e. federal, state and/or local – may receive funding. Eligible HVRP applicants are state and local workforce investment boards; public agencies (state, county and city levels); for-profit/commercial entities; and nonprofit organizations including faith-based and community organizations. 501(c)(4) nonprofit organizations are ineliglble for funding. All HVRP grants are competitively awarded on an annual basis with optional year funding (2 years), based on the availability of funds and satisfactory performance. For more information on the HVRP, click here. 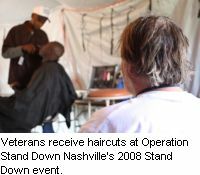 "Stand Down" events are held in a locality, usually for one to three days, where services are provided to homeless veterans along with shelter, meals, clothing, employment services and medical attention. These events are mostly all-volunteer efforts that are organized within a community and bring together services providers including VA; HUD; the local Continuum of Care; veterans service organizations; military personnel; civic leaderes; and other interested individuals, groups and organizations. HVRP grantees and sub-awardees are responsible for participating in Stand Down events. Each grantee is expected to apply separately for the authorization to obligate and expend up to $10,000 per year for such an event. Funding must be used to enhance employment and training opportunities, or promote “self-sustainment” for homeless veterans. Funds may be used for food items, prepared meals, bottled water, clothing (including shoes, boots, underwear, socks, coats), sleeping bags, personal hygiene care kits, facility and tent rentals, transportation to and from the Stand Down, event publicity, etc. Send the completed application packet to your VETS State Director for consideration – a list of state directors is available here. The VETS State Director makes recommendations and forwards applications to the Regional Office, which then submits them to the DOL-VETS National Office in Washington, D.C.
VWIP grants meet the needs for workforce investment activities of veterans with service-connected disabilities, veterans who have significant barriers to employment, veterans who served on active duty in the Armed Forces during a war or in a campaign or expedition for which a campaign badge has been authorized, and recently separated veterans within 48 months of discharge (under conditions other than dishonorable). DOL is authorized to competitively award VWIP grants to public agencies, state and workforce investment boards, and private nonprofit organizations (including faith-based and neighborhood partnerships) that the Secretary determines to have an understanding of the unemployment problems of veterans, familiarity with the area to be served, linkages with One-Stop Career Centers, and the capability to administer a program of workforce investment activities for such veterans effectively. For more information, visit the DOL-VETS website.